Unable to hide the tears, Daniel explained that he had been crying since the baptism. 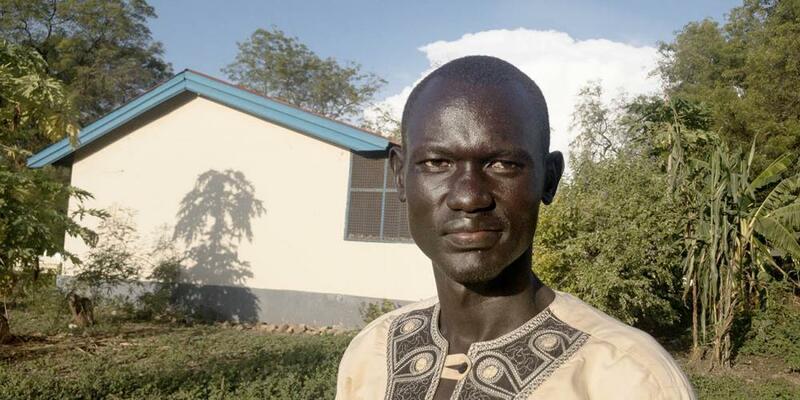 Daniel Deng Machiek, a tall, tough soldier in South Sudan’s military, didn’t want to fight. The eastern African region was embroiled in a bloody civil war, and Daniel didn’t want to kill his fellow countrymen. For three days, he fasted and prayed for peace in December 2013. On the third day, Daniel had a nighttime dream. Three shining angels appeared in the bedroom in Yirol, his birthplace, located eight hours by bus northwest from South Sudan’s capital, Juba. “Wake up, and sing a song with us,” one angel said. Still in the dream, Daniel joined the angels in singing a song of praise for Jesus’ salvation. Then the angels took him to Lake Yirol just outside town. One angel dressed Daniel in a white robe and baptized him in the lake, while the other two angels watched. Afterward, the angels gave him a Bible and directed him to a nearby church. “You will find something interesting there,” an angel said. Then the angels disappeared. Daniel went into the church, where he saw people lying dead on the floor. Only a small 2-year-old boy was alive, and he asked the boy to pray with him. As they prayed, the dead church members came alive. At that moment, Daniel woke up from the dream. For the next three years, he wondered what the dream meant. In 2017, he met a Christian pastor who baptized him and his wife during Sunday worship services. When Daniel came up from the water, he did something that he had never done as an adult: He cried. “Why am I crying?” he asked the pastor. “It is the work of the Holy Spirit,” the pastor replied. Daniel was confused and angry. The anger made him cry even more. He felt terribly embarrassed. Men don’t cry in South Sudan, and tough soldiers definitely don’t cry. Daniel cried nonstop for two days. Then his 22-year-old nephew, Abraham, came to visit. Unable to hide the tears, Daniel explained that he had been crying since the baptism. Abraham gave his uncle a Bible study on the biblical seventh-day Sabbath. Immediately, Daniel was convinced that he should worship at Abraham’s Seventh-day Adventist church. The next Sabbath, he and his wife attended the Juba Central Seventh-day Adventist Church together. Three months later, on Jan. 20, 2018, the couple was baptized. Daniel didn’t shed a tear as he came up from the water. “My dream had been fulfilled!” he exclaimed to the congregation, and he shared the story about his dream. Seeing the Daniel’s newfound joy, one of his brothers and the brother’s wife have been baptized, and his mother is preparing for baptism. Daniel, now 39, said he is amazed with how God answers prayer. He prayed for peace for South Sudan in 2013, and Jesus answered with a dream that showed the path to real peace — giving his heart to Jesus through baptism. Thank you for your 2016 Thirteenth Sabbath Offering that helped construct children’s Sabbath School classrooms at Juba Central Seventh-day Adventist Church, where Daniel worships on Sabbaths. Part of the fourth quarter 2019 offering will help construct a high school near the church. Balancing the Scales One day a strange tourist came to his hotel. The two men gradually became friends. Until one day, the hotel worker learned God does not require us to balance the scales of righteous doing. He Tried to Balance the Scales A blind woman ministers to other blind people, a center of influence in Germany uses the arts, and a man in the middle east who hated Christians.